In 1974 Joni Mitchell had her first and only top 10 Billboard hit with the song "Help Me". The song was very innovative with a perfect mixture of folk, jazz, and soft rock. The song was from Joni Mitchell’s album Court and Spark which happened to be the pinnacle of her career. Back in 1974 the same could be said about Pontiac. Pontiac once known as the old ladies division of GM, had reinvented itself by forging a path towards performance starting in the late-1950s. By the 1960s, with the GTO and other performance offerings, there was no mistake Pontiac was GM’s performance division and every other carmaker was trying to catch up. By the 1970s things had abruptly changed – government regulations and high insurance costs killed overnight the beloved muscle car. By 1971 all the American automakers were running to the hills and abandoning performance cars faster than Senator Thomas Eagleton’s Vice Presidential nomination on the 1972 Democratic ticket was flushed down the toilet. Pontiac not only didn’t care, but it released some of its hottest performance V8s after the muscle car bubble had burst. In 1971 and 1972 the round-port (LS5) 455 CID HO V8 was standard in the Trans Am and optional in the GTO and Firebird Formula. Car and Driver magazine back in the day with a 455 HO equipped 1972 Trans Am obtained a 0-60 mph time of 5.4 seconds and a 1/4 mile time of 13.9 seconds at 102 mph. Horsepower by 1972 was rated in the more conservative "net" rating versus the previous "gross" rating. Even so Pontiac rated the 1972 455 HO at 300 net horsepower and 415 lb-ft of torque. Hey who were they kidding? Even though 300 net horsepower in 1972 was a lot of horsepower, Pontiac’s quoted figure was underrated. If you’re still not a believer. Try this on for size, a 1972 Trans Am hit the scales at a little over 3,800 lbs and it supposedly had 300 net horsepower. As a comparison take a 2010 Camaro V6 which at 3,780 lbs is around the same weight as a 1972 Trans Am and also 300 net horsepower. The new Camaro when compared to the 1972 Trans Am has a better gear box, traction control, much better tires, far superior aerodynamics, and other advantages which should make the Camaro the easy winner. However not the case, a 2010 Camaro V6 is good for about 6.0 seconds 0-60 mph and a 1/4 mile of about 14.3 seconds at 98 mph – substantially slower than the 1972 Trans Am which is proof the 455 HO’s horsepower rating was underrated. And before you start doubting the Camaro’s quickness take this into an account its performance times would have been considered very impressive and right in fast muscle car territory back in the 1960s. Pontiac retired the 455 HO at the end of the 1972 model year and for 1973 the new base Trans Am motor was the the D-port (L75) 455 V8 rated at 250 horsepower. This was more than enough to fend off the remaining competition. After-all the 1973 Dodge Challenger no longer had a 426 Hemi CID V8 or a 440 CID V8 under the hood. Even the 383 CID V8 option was gone. The Challenger’s hottest motor for 1973 was a small-block 4-bbl 340 CID V8. Same was true with the Mustang for 1973, a small-block 4-bbl 351 CID V8 was as good as it got. With that in mind a 250 horsepower 455 V8 for the Trans Am was like finding a pot of gold under the rainbow. However it was not enough for Pontiac – a new high performance 455 was due to make the scene. It would be the V8 engine that Pontiac would be most remembered for producing. Using the old "Super Duty" moniker from the early-1960s high performance Pontiac Super Duty 421 and 389 CID V8s, the new engine would be called the "Super Duty 455" or "SD-455" for short. Unfortunately the (LS2) SD-455 was pulled right before production by the new head honcho at Pontiac, Martin J. Caserio who felt a high-performance V8 engine was no longer a necessity. 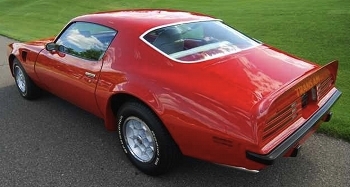 However a few brave souls at Pontiac persisted and eventually later on in the 1973 model year the SD-455 V8 was produced in small numbers as a Trans Am and Firebird Formula option – 252 Trans Ams and 43 Firebird Formulas were equipped for the 1973 model year with the SD-455. Interesting to note, even though a pre-production SD-455 powered 1973 GTO had won Hi-Performance Cars magazine’s car of the year award for 1973, the SD engine option never was available for the GTO. When the 1974 model year rolled in things got better. 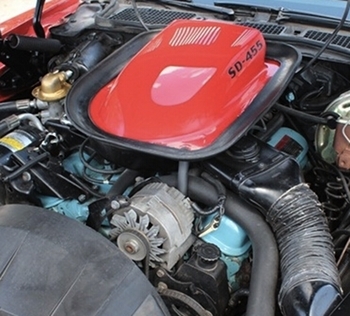 The SD-455 was back in larger numbers – 943 Trans Ams and 58 Firebird Formulas came equipped with the SD-455 motor that year. The Firebird lineup including the Trans Am received a mild facelift and a slight rear-end update for 1974. The front end now slanted back towards the hood and was more aerodynamic than the previous year. The downside was there was now a long horizontal black front rubber bumper – not as clean styling wise as the sculpted Endura front nose piece of the previous year. There was also a matching long horizontal black rear bumper which replaced the previous year’s chrome bumper. The reason for the new bumpers was new stricter federal bumper regulations had taken affect for 1974. The plus side was that Pontiac did integrate twin vertical bumperettes around the front license plate which blended well with the new frontal area. In the rear the license plate mounting area moved from below the rear bumper to above where it was now located between the taillights. Below the rear bumper were two vertical black bumperettes. Also adding to the sharp lines of the Trans Am were a set of 15×7 inch Rally II wheels and optional were a set of the very attractive 15×7 inch Honeycomb wheels. The good news concerning the 1974 Trans Am SD-455 was it was available in any of the 1974 Trans Am exterior colors. The downside was there were only three colors to choose from: Cameo White, Buccaneer Red, and Admiralty Blue (a new color for 1974). The Trans Am’s interior was a carryover from the previous year. Bucket seats were standard and so was the sporty black Pontiac formula steering wheel. The "turned-aluminum" dash (beautiful decorative aluminum dash trim with tiny round swirl marks) also was a carryover. Truth be known Pontiac didn’t have to do anything to the interior for 1974, it was still the sharpest interior one could find in an American performance car during this time period. Same could be said about the 1974 Trans Am’s handling and braking, it was the best you were going to find in an American car with the exception of the Corvette which had four wheel disc brakes – something that the Trans Am would not have as an option until 1979. 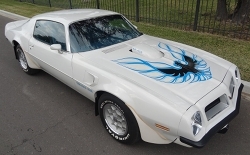 The Trans Am had so much going for it in 1974 yet even today it’s most remembered for the big hood bird decal which was a low-cost option ($55.00 to be exact) – one which was on a majority of Trans Ams produced that year. The hood decal had been introduced for 1973 to much fanfare and would soon become a cultural icon of the 1970s. The Trans Am was the epitome of macho. There was no car more manly and outlandish than the Trans Am during this period. From the array of spoilers, fender flares, and the shaker hood scoop there was nothing else like it on the road back in the day. The Trans Am during the 1970s provided the flash, but it was the SD-455 that provided the Trans Am a serious blast of power. The SD-455 used a fortified engine block that consisted of 4 bolt main bearings. The SD-455 had a bore and stroke of 4.15 x 4.21 inches and had forged pistons. Free-flow round-port heads and Ram Air exhaust manifolds were the big contributors to horsepower for the SD. And Pontiac threw in for a good measure an 800 cfm Rochester quadrajet 4-bbl carburetor and even dry slump oiling for the SD. The 1973 SD-455 was rated by Pontiac at 310 net horsepower and 390 lb-ft of torque. However this horsepower figure was finalized by Pontiac when the 1969-1970 Ram Air IV (400) cam was expected to be used in the production SD-455. However due to difficulty passing EPA emissions testing with the Ram Air IV cam, a more moderate one was used instead (the 1967 Ram Air 400 cam). This had Pontiac decreasing the SD-455’s official output to 290 horsepower but torque rose slightly to 395 lb-ft. Yet due to the SD-455 not arriving until late in the 1973 model year most still wrongly attribute the 1973 SD-455 as being rated at 310 horsepower since Pontiac had used this figure in its 1973 literature and press materials which were printed before the 1973 model year. However it’s all irrelevant, the 290 and even 310 net horsepower ratings are too conservative, real output was higher. Hot Rod magazine (June 1973) tested a automatic transmission equipped 1973 Trans Am SD-455 and obtained a 1/4 mile time of 13.54 seconds at 104.3 mph. To get an idea of how earth shattering these figures were – the average 1/4 mile time of Mopar’s legendary 425 (gross) horsepower 426 Hemi V8 powered muscle cars – such as the 426 Hemi powered 1969 Dodge Charger 500 as tested by Hot Rod magazine (February 1969) obtained a 1/4 mile of 13.48 seconds at 109 mph a good example of the average performance mean of the 426 Hemi – some 426 Hemi performance times back in the day were slower and some were faster. Another comparison example is Chevrolet’s legendary 450 (gross) horsepower LS6 454 CID V8 powered 1970 Chevelle SS which also had an average 1/4 mile time (in magazine tests) back in the day of mid-13 second range (one of the best tests of which was 13.12 seconds at 107.01 mph obtained by Car Craft magazine – November 1969). Both the Hemi 426 Mopars and the Chevrolet Chevelle SS LS6 454 are considered by most to be the hottest mass produced muscle cars of the golden era. So with the SD-455 Trans Am – a muscle car produced after the original muscle car era was dead, being able to run with the best of them was an enormous victory for Pontiac. And the SD-455 did all this with a low compression ratio of 8.4:1 versus the Hemi 426’s 10.25:1 and the LS6 454’s 11.25:1 high compression ratios. Also many of the Hemi cars and LS6 454 Chevelles tested (by magazines) back in the day were running racing spec 4.10 rear gears while the SD-455 as tested by Hot Rod was only using 3.42 rear gears. The 1973 Trans Am SD-455 also had the disadvantage of tipping the scales at 3,850 lbs which was heavier than than the Hemi powered Mopars and the Chevelle LS6. With all this considered it’s no wonder why many consider the SD-455 to be one of the most legendary muscle car engines ever produced. Interesting to note there are persistent rumors that the Hot Rod test car was equipped with the Ram Air IV cam instead of the production (1967 Ram Air spec) cam and the shaker hood scoop was functional (unlike the production car which was closed to fresh air) – however no conclusive evidence has surfaced to prove these rumors true at this time. The 1973 SD-455 carried over with no changes into the 1974 model year. 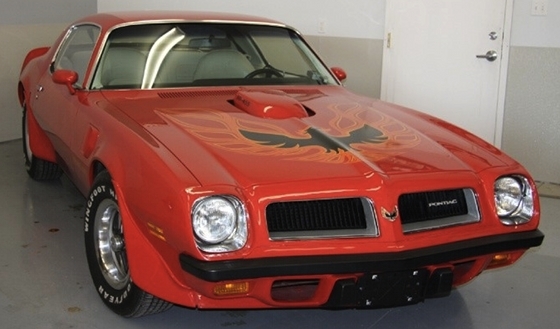 The SD engine option was not cheap adding $450.84 to the 1974 Trans Am’s sticker price, but with the performance it delivered made it worth every penny of the extra cost. Especially considering the base 1974 Trans Am engine was the 225 horsepower (L78) 4-bbl 400 CID V8. Fortunately the D-port (L75) 455 V8 was back as a Trans Am option and still rated at 250 horsepower. Interesting to note all SD-455 motors were hand assembled with more time and attention to detail in assembly being performed than any other performance Pontiac engine ever built. Ironically unlike many of the Pontiac muscle car engines this engine had painted engine valve covers and not the usual chrome. 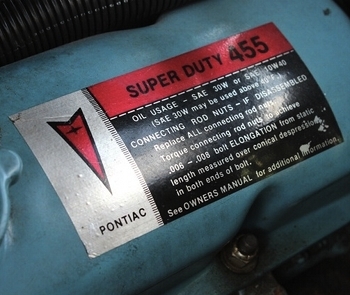 However every SD-455 V8 did have a "Super Duty 455" sticker on the driver side engine valve cover. And when the hood was closed the shaker hood scope clearly proclaimed what was below the hood with "SD-455" callouts. 1974 would be the last year for the SD-455. It would also be the last year for true dual exhausts and no emissions controls for the Trans Am. By 1975 it all changed, the introduction of the catalytic converter and other emissions controls pushed performance into a downward spiral. 1974 was also the last year for the TH400 3-speed automatic transmission and for the Muncie 4-speed manual transmission. It is rumored that the switchover from the Muncie 4-speed to the Borg Warner T10 4-speed occurred toward the end of the 1974 model year so there are reported to be a few late model year SD-455 1974 Trans Ams equipped with the T10. Both the manual and automatic transmission equipped 1974 SD Trans Ams came standard with a 3.42:1 rear axle ratio. However when air conditioning was ordered with either of these two transmissions, the rear axle ratio was a slightly taller 3.08:1. Joni Mitchell’s "Help Me" is almost forty years old but it is as timeless as when it was first released, it was a beautiful melody that not only captured that particular era of the 1970s but even today never grows old. Same can be said about the 1974 Trans Am SD-455 it was the perfect beautiful melody of styling and horsepower that even today never grows old. Back in 1974, the Super Duty Trans Am was the undeniable king – it was the ultimate muscle car. Fortunately for muscle car fans, somebody forgot to tell Pontiac the muscle car era had ended a few years beforehand.